My first pet was a childhood Christmas Eve gift. Somewhere I have a snapshot of a brown-and-white Chinese pug, small enough to fit in my father’s hand, cute enough to steal my eight-year-old heart. We named her Liz. I carried her all day. Her floppy ears fascinated me, and her flat nose amused me. I even took her to bed. So what if she smelled like a dog? I thought the odor was cute. So what if she whined and whimpered? I thought the noise was cute. So what if she did her business on my pillow? I can’t say I thought that was cute, but I didn’t mind. In our pre-dog discussions, Mom and Dad had made it clear that I was to be Liz’s caretaker, and I was happy to agree. When she came home, I cleaned her little eating dish and opened her can of puppy food. The minute she lapped up some water, I refilled it. I kept her hair combed and her tail wagging. I didn’t like hearing those words—your dog. I wouldn’t have minded “your dog to play with” or “your dog when you want her” or even “your dog when she is behaving.” But those weren’t my parents’ words. They said, “Liz is your dog.” Period. In sickness and in health. For richer, for poorer. In dryness and in wetness. That’s when it occurred to me. I am stuck with Liz. The courtship was over, and the honeymoon had ended. We were mutually leashed. Liz went from an option to an obligation, from a pet to a chore, from someone to play with to someone to care for. Sound familiar? That “trapped” feeling that comes with being in a situation you can’t escape? Only instead of being reminded, “She is your dog,” you’re told, “He is your brother.” Or, “She is your lab partner, math teacher, picky-aunt-who-means-well . . .” or any other relationship that requires loyalty for survival. Such permanence can lead to panic—at least it did in me. I had to answer some tough questions. Can I put up with the same flat-nosed, hairy, hungry face every morning? Am I going to be barked at until the day I die? Will she always use the inside of the house as a bathroom? Attacks of stuckititis are limited to people who breathe, and typically occur somewhere between birth and death. Stuckititis shows itself in irritability, short fuses, and a mountain range of molehills. The always-helpful Max’s Manual identifies three ways to cope with stuckititis: flee, fight, or forgive. My manual has no model for how forgiveness occurs . . . but the Bible does. Jesus himself knew the feeling of being stuck with someone. For three years he ran with the same crew. By and large, he saw the same dozen or so faces around the table, around the campfire, around the clock. They rode in the same boats and walked the same roads and visited the same houses, and I wonder, how did Jesus stay so devoted to his men? Not only did he have to put up with their visible oddities, he had to endure their invisible quirks. Think about it. He could hear their unspoken thoughts. He knew their private doubts. Not only that, he knew their future doubts. What if you knew every mistake your loved ones had ever made and every mistake they would ever make? What if you knew every thought they would have about you, every irritation, every betrayal? Was it hard for Jesus to love Peter, knowing that Peter would someday curse him? Was it tough to trust Thomas, knowing Thomas would one day question Jesus’ resurrection? Just days before Jesus’ death, his disciples were arguing about which of them was the best! How did Jesus resist the urge to recruit a new batch of followers? How was he able to love people who were hard to like? Few things stir panic like being trapped in a relationship. It’s one thing to be stuck with a puppy but something else entirely to be stuck in a family or school or friendship situation. We might chuckle over goofy terms like stuckititis, but for many, this is no laughing matter. Which is why it’s such a perfect way to begin our study of what it means to be just like Jesus—by examining his heart of forgiveness. How was Jesus able to love his disciples? The answer is found in the thirteenth chapter of John, when Jesus kneels before his disciples and washes their feet. Jesus washes our feet for two reasons. The first is to give us mercy; the second is to give us a message. And that message is simply this: Jesus offers unconditional grace; we are to offer unconditional grace. The mercy of Christ came before our mistakes; our mercy must come before the mistakes of others. Those in the circle of Christ had no doubts of his love; those in our circles should have no doubts about ours. What does it mean to have a heart like his? It means to kneel as Jesus knelt, touching the grimy parts of the people we are stuck with and washing away their unkindnesses with kindness. Or as Paul wrote, “Be kind and loving to each other, and forgive each other just as God forgave you in Christ” (Ephesians 4:32 NCV). “But, Max,” you are saying, “I’ve done nothing wrong. I’m not the one who cheated or lied. I’m not the one with the annoying habits. I’m not the guilty party here.” Perhaps you aren’t. But neither was Jesus. Of all the men in that room, only one was worthy of having his feet washed. And he was the one who washed the feet. The one worthy of being served, served others. The genius of Jesus’ example is that the burden of bridge-building falls on the strong one, not on the weak one. The one who is innocent is the one who makes the gesture. And you know what happens? More often than not, if the one in the right volunteers to wash the feet of the one in the wrong, both parties get on their knees. Don’t we all think we are right? Therefore, we all wash each other’s feet. © 2003 Published by Tommy Nelson® (a div. 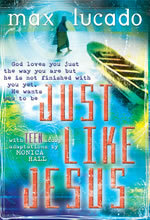 of Thomas Nelson, Inc.)/Written by Max Lucado/Adaptations by Monica Hall. Used by permission.